Intertops sportsbook favors the Pittsburgh Steelers by seven points over the Arizona Cardinals in the Super Bowl on February 1st, but two players from the internet’s very first sportsbook probably don’t much care who wins – they’re going to Tampa all-expenses paid by Intertops. William S. of California won last month’s Super Bowl Contest at Intertops and will be taking his wife to Tampa for the big game. Many American football fans think the Cardinals, who haven’t won an NFL title since 1941, may not have a defense that can hold back Pittsburgh. Virtually every betting line favors the Steelers. The Cardinals questionable defense did help win three playoff games pretty decisively though. If the Cardinals manage to break through the Steelers’ defense, those that put their money on the underdogs will clean up. 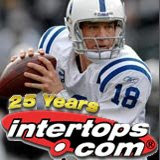 In addition to who will win the most-gambled-on-event of the year, Intertops offers a huge range of other Super Bowl betting propositions including MVP: Pittsburgh’s Ben Roethlisberger is favored to win that at +135, followed by Arizona’s Kurt Warner at +325 and Larry Fitzgerald at +500. Intertops is also taking bets on which team will be the first to score ten points with odds of +5000 that neither team will reach that mark. Intertops’ odds on who will win the game and a variety of other betting propositions are posted at Intertops.com/sportsbook and are updated daily. Intertops welcomes Super Bowl wagers from around the world, including the US.